When the 3E error appears on the display, the washing stops. The process does not resume until the fault code’s eliminating. This code corresponds to a tacho sensor error – a weak or missing signal. When does the 3E error code appear in the Samsung washer? The 3E code has analogs with a similar decoding. It is about the next error codes: 3E1, 3E2, 3E3, 3E4, 3C, 3C1, 3C2, 3C3, 3C4, EA, 8E, 8E1, 8C, 8C1. The appearance of EA is typical for Samsung washing machines of 2008 production. 8Е, 8Е1, 8С, 8С1 error codes appear in the devices, manufactured before 2013. If your machine does not have a display, pay attention to the burning lights: 60°C and 40°C. The mode indicators flash. Spinning, when the machine rotates the drum for a little and issues the 3E sign. 3C signals about reducing of the washing machines’ motor power. Malfunction of the control module. Such common things as drum overloading with laundry can lead to the e3 error code occurrence. If you put too little clothes, the 3E error may appear. This code signals the jamming of the drum due to foreign objects stuck between the tank and the drum. Еhe engine does not have enough power to overcome jamming. Complete tacho sensor burnt out and breakage of connection with it can cause the 3E error. 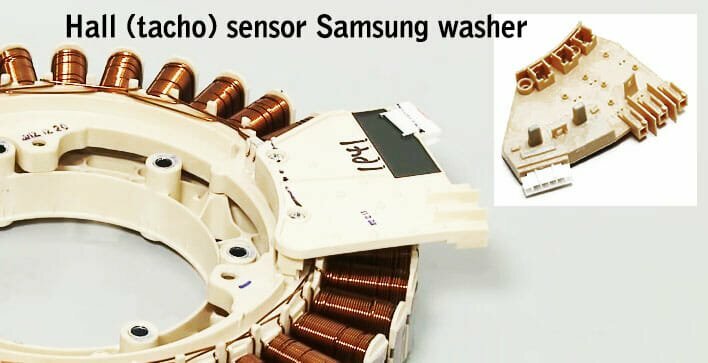 If Samsung washer is equipped with a vibration sensor instead of the hall sensor, the same problem occurs. Also, the 3E error can indicate the loss of engine power due to the worn out brushes or broken windings. Tacho sensor may provide incorrect signals. It refers to oxidation of the magnetic ring or of the motor shaft. Also, dirt gets between the motor shaft and the ring of the hall sensor. It causes the same problems. The attenuation of the tacho sensor signal or its periodic disappearance may refer to the poor attachment of this sensor to the motor. All of this can also generate the 3E error code. 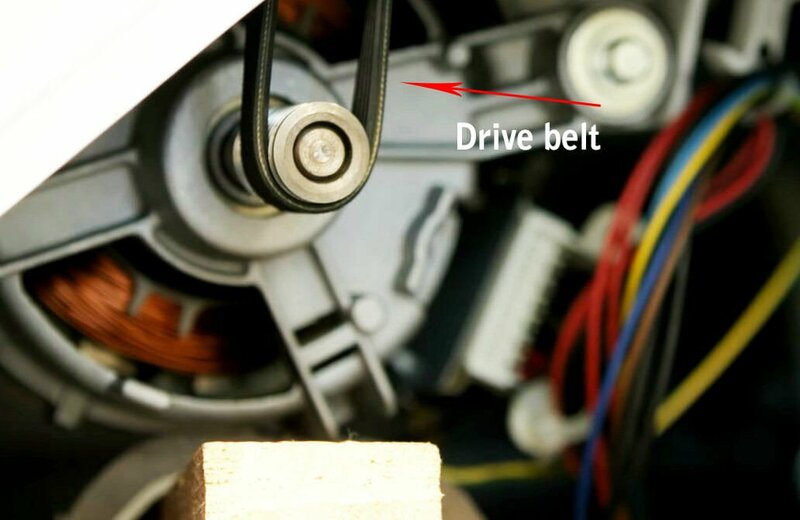 A weakened drive belt is one of the rarest causes of the 3E error and its analogs occurrence. Because of this problem, the engine can start rotating and spin the drum. So, the self-diagnosis system of the washer takes it as problems with the motor. Thus, it issues the 3E fault. When washing machine overloading, turn it off and pull out excess clothes. Then start the device again. When the drum is jammed, remove the foreign object through the hole for the heating element. To get the heater, you need to remove the front wall of the technique. If the control fails temporarily, turn off the machine. Take the cord out of the network for a few minutes. Then, turn it on again. With drive belt weakening, change this part. If the control module fails, solder the burned elements on the board. Also, you might need to completely replace the module.